I'm not going to call this a race report, I don't even know who won. There's other guys that can tell you that (that link is also a great place to check for photos of the race). This is a run report, where I tell you about the route (this case being a trail) and the experience. There's something about trail runs for me. I'm terrible at them, and super slow, yet I still enjoy it. Most runners are more laid-back than in road races and if you're struggling there's someone else right there with you or either they will be coming along soon. The atmosphere of the Red Bug trail race in Tallahassee, Florida is no exception. This past Saturday, August 1, was the fourth and final race of the third annual Gulf Winds Track Club Summer Trail Series. I ran the whole series in its debut year, skipped last year due to having just had a baby, and this year I only ran the final race. This one is different from the others—and different from most races—in that you don't have to get up early for it. It's a 6:00pm, the time trade-off, however, means that it's HOT. I guess it's good prep if you're running the St. George Island Sizzler, which is this coming Saturday (August 8) and another evening race. Now, I'm not going to try to say much as far as comparing the course to that of the others in the Summer Trail Series, I don't remember them well enough to do that. I will tell you what to expect from this one though. If you are not familiar with Forest Meadows or Elinor Klapp-Phipps park, it's really worth exploring sometime. 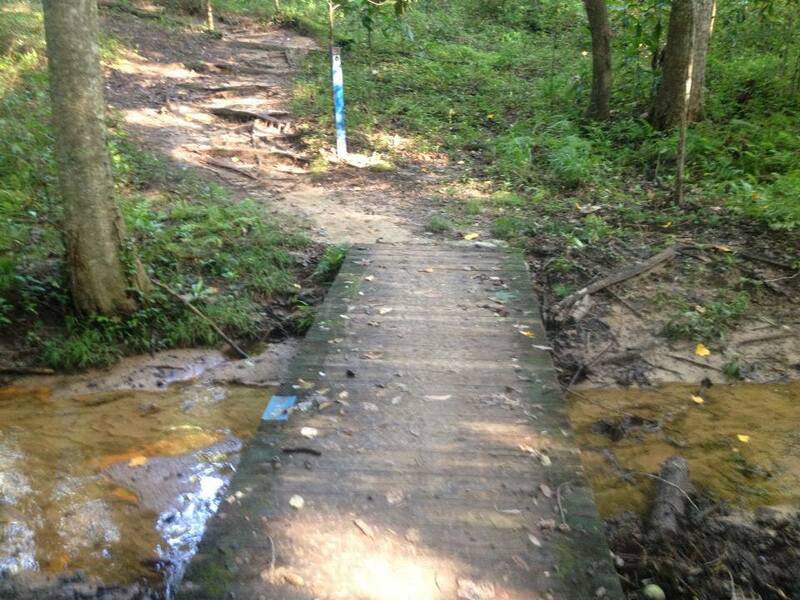 Red Bug is one of many trails on the property. The route the race course follows places the starting line in the parking lot directly in front of the tennis courts of Forest Meadows located on North Meridian Rd. Runners head north from there, around the playground and clubhouse and into the woods (cue theme song!). After first entering the woods, runners cross over several man-made bumps that I would equate with running over speed bumps on the road, this is a mountain bike trail, after all. As we get deeper into the woods (there's that song again), the trail gets narrower and more roots start popping up at you. It rained off and on the day of the race and parts of the course started to get slippery even in my Altra Superior trail shoes. We twist and turn for about 2.5 miles before emerging from the woods for a brief stop at the hydration station positioned in front of the athletic fields. If you're running this trail at a time other than during the race, there is a water fountain here. Once we're hydrated we re-enter the woods (song didn't get me that time) for two more miles that will seem longer than the first 2.5. When we've crossed to the other side of the park, now south of the tennis courts, there's not quite so many roots to trip on, but don't let your guard down just yet. 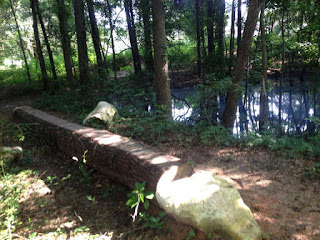 While there were some water crossings (even one without a bridge—I hopped over it just fine, but depending on rain, like last year, you could get your feet pretty wet) earlier, this part of the trail has a wooden boardwalk, so be careful where you step. Around this part of the course, you're going to start thinking you're nearly done, especially if you're not using GPS and it's hard to get a satellite with my Garmin FR10 here. You're not done, you just get a little glimpse of the parking area, such a tease. Before the finish, runners cross back behind the tennis courts again, wind around a little on that side of the park where the ground is flatter, and come out with the playground (and if you're like me your kids playing) on your right just before the finish line. You made it! This race is on a single-track mountain bike trail, with a lot of roots, if you're new to trail running it might not be the best place to start. There are, however, wider multi-use trails in the area to provide a good starter's course to get you ready for more technical trails. As far as hills, there are only a couple spots that stood out to me as having quick and steep inclines and even less descents, so I'd say it's pretty tame in that regard. The Summer Trail Series has good support, a water/Gatorade station near the halfway point, and the trails are well marked with flags at every intersection. After the race snacks were plentiful and included watermelon, ice-pops, and fruit (and probably some type of gluteny carbs I was trying to avoid). This year, I even participated in a couple of trail preview runs that were held during the week leading up to the races. I enjoyed the preview as a way to prepare for the race, that way halfway through the race I wasn't wondering if it was almost over yet; I knew what was coming up. Passing the runner ahead of you on single-track like this can be tricky, but a polite "on your left," and they won't mind stepping aside for you. In fact, many runners will move off the trail to let you pass when they hear you coming. Watch out for poison ivy though! Actually, I didn't notice as much poison ivy on this trail as I have others in the area. A rep from Salomon was at this race with demo shoes that runners could try out on the trails, and there were also some given as raffle prizes along with other gear. Speaking of gear, I can't forget to mention the shirts from this year's series. Included with pre-registration for the series, is a New Balance sleeveless tech shirt (muscle shirt style, to show off those guns I earned from PiYo) with the series logo on the chest and back. Bright pink for the ladies, and it's a nice breathable weave, not like some tech shirts that just seem too solid to me. This is probably my favorite race shirt in the three years that I've been running. The series is limited to 150 runners, so if you want to register for it next year keep an eye out for registration opening next April. In the meantime, check out Gulf Winds Track Club's calendar for other Tallahassee area races. Thanks to race director Bobby York for providing me with photos of the trail. 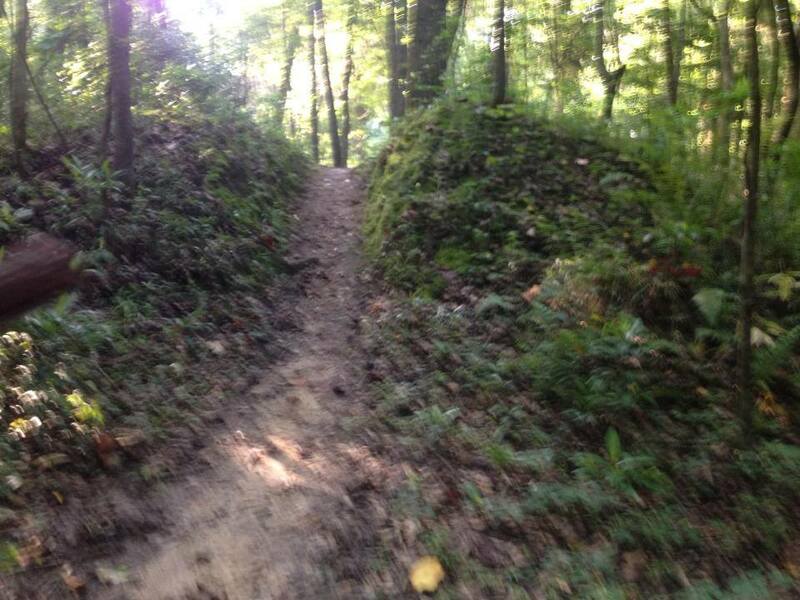 Do you like running trails? If so, where is your favorite? If not, why not? My favorite trails of all time are in no particular order: Catalina Island trails (marathon or half), Pikes Peak, and Grand Canyon's Kaibab/Bright Angel for a single or double crossing! I also have a fondness for the trails surrounding my house as I ran them many times and still like to get out there and up to the top-but not as frequently as I used to. Sounds like you've had some awesome trail opportunities! Thanks for the comment. Great writeup!! So happy to have shared the trail with you this year! Thanks Paula! Are you going to do Miller Landing Madness?